Not sure where to get started? Read our birthday gift guide below for selecting the perfect birthday gift for that certain someone. Also check out our Astrology Floral Guide, guide to Birth Month Flowers, or Flower Color Guide to learn how to impart special significance to your gift. Send Teleflora's Brilliant Birthday Blooms flower arrangement today! Just because you can't be there in person on the big day doesn't mean you can't give the guest of honor a festive salute. This bouquet delivers the bash to their doorstep, complete with our signature birthday-candle bowl bursting with colorful flowers and curling party ribbons. This flower gift is so bright and cheerful, it's like delivering your personal rendition of "Happy Birthday to You" – minus the off-key notes. Fancy Flowers floral arrangement is a big, beautiful tribute to the guest of honor on her special day. On her big day, she deserves to have it all: beauty, elegance, flair - and lots of it. 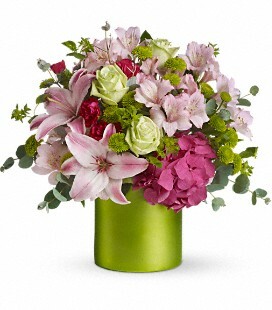 That's the message behind this floral gift, it features lilies, roses and hot pink hydrangea. The flower delivery arrives inside a shimmery green cylinder vase she’ll display long after the flowers are gone. Send a Be Happy Mug to make them smile! Send Teleflora's Be Happy® Bouquet, it puts an infectious smile on the proceedings. Brimming with cheerful white and yellow daisies and roses, it's one flower delivery that sends a message of loyalty and friendship. Maybe they're not thrilled about adding another candle to the cake. Or perhaps you want to provide an extra dose of cheer to an already festive occasion. The floral arrangement arrives inside Teleflora's Be Happy Mug, which can be reused throughout the year to deliver a smile with their morning cup of joe. Teleflora's Bamboo Getaway flower gift is an artful zen display of tropical lilies, red gerbera daisies and exotic green foliage arranged in a sleek bamboo container. Perfect for the desk of an overworked friend or the coffee table of a new mom or dad, these birthday flowers encourage them to take a deep breath, slow down and enjoy the moment.